The Mantell UFO incident was among the most publicized early UFO reports. 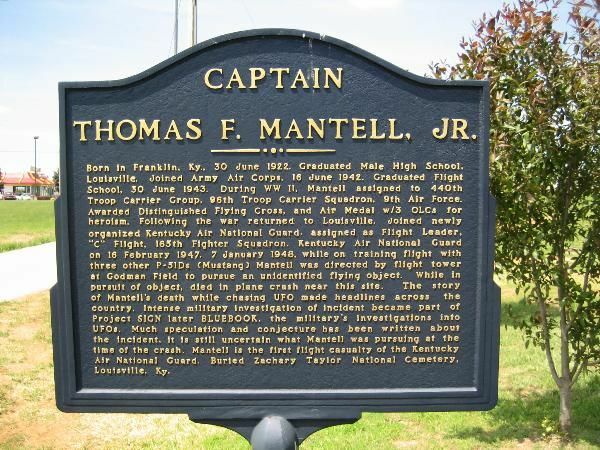 The incident resulted in the crash and death of 25-year-old Kentucky Air National Guard pilot, Captain Thomas F. Mantell, on 7 January 1948 while in pursuit of a UFO. Historian David M. Jacobs argues the Mantell case marked a sharp shift in both public and governmental perceptions of UFOs. Previously, the news media often treated UFO reports with a whimsical or glib attitude reserved for silly season news. Following Mantell's death, however, Jacobs notes "the fact that a person had died in an encounter with an alleged flying saucer dramatically increased public concern about the phenomenon. Now a dramatic new prospect entered thought about UFOs: they might be not only extraterrestrial but potentially hostile as well." However, later investigation by the US Air Force's Project Blue Book indicated that Mantell may have died chasing a Skyhook balloon, which in 1948 was a top-secret project that Mantell would not have known about. Mantell was an experienced pilot; his flight history consisted of 2,167 hours in the air, and he had been honored for his part in the Battle of Normandy during World War II. On 7 January 1948, Godman Field at Fort Knox, Kentucky, received a report from the Kentucky Highway Patrol of an unusual aerial object near Maysville, Kentucky. Reports of a westbound circular object, 250–300 feet (80–90 m) in diameter, were received from Owensboro and Irvington. At about 1:45 p.m., Sergeant Quinton Blackwell saw an object from his position in the control tower at Fort Knox. Two other witnesses in the tower also reported a white object in the distance. Colonel Guy Hix, the base commander, reported an object he described as "very white," and "about one fourth the size of the full moon ... Through binoculars it appeared to have a red border at the bottom ... It remained stationary, seemingly, for one and a half hours." Observers at Clinton County Army Air Field in Ohio described the object "as having the appearance of a flaming red cone trailing a gaseous green mist" and observed the object for around 35 minutes. Another observer at Lockbourne Army Air Field in Ohio noted, "Just before leaving it came to very near the ground, staying down for about ten seconds, then climbed at a very fast rate back to its original altitude, 10,000 feet, leveling off and disappearing into the overcast heading 120 degrees. Its speed was greater than 500 mph (800 km/h) in level flight." Four P-51 Mustangs of C Flight, 165th Fighter Squadron Kentucky Air National Guard already in the air—one piloted by Mantell—were told to approach the object. Blackwell was in radio communication with the pilots throughout the event. One pilot's Mustang was low on fuel, and he quickly abandoned his efforts. Air Force Captain Edward J. Ruppelt (the first head of Project Blue Book) notes that there was some disagreement amongst the air traffic controllers as to Mantell's words as he communicated with the tower: some sources reported that Mantell had described an object "[which] looks metallic and of tremendous size," but according to Ruppelt, others disputed whether or not Mantell actually said this. The other two pilots accompanied Mantell in steep pursuit of the object. They later reported they saw an object, but described it as so small and indistinct that they could not identify it. Mantell ignored suggestions that the pilots should level their altitude and try to more clearly see the object. Only one of Mantell's companions, Lt. Albert Clemmons, had an oxygen mask, and his oxygen was in low supply. Clemmons and a Lt. Hammond called off their pursuit at 22,500 feet (6,900 m). Mantell continued to climb, however. According to the Air Force, once Mantell passed 25,000 feet (7,600 m) he blacked out from the lack of oxygen (hypoxia), and his plane began spiraling back towards the ground. A witness later reported Mantell's Mustang in a circling descent. His plane crashed on a farm south of Franklin, Kentucky, on the Kentucky–Tennessee state line. Firemen later pulled Mantell's body from the Mustang's wreckage. His seat belt was shredded, and his wristwatch had stopped at 3:18 p.m., the time of his crash. Meanwhile, by 3:50 p.m. the UFO was no longer visible to observers at Godman Field. The Mantell incident was reported by newspapers around the nation, and received significant news media attention. A number of sensational rumors were also circulated about Mantell's crash. According to UFO historian Curtis Peebles, among the rumors were claims that "the flying saucer was a Soviet missile; it was [an alien] spacecraft that shot down [Mantell's fighter] when it got too close; Captain Mantell's body was found riddled with bullets; the body was missing; the plane had completely disintegrated in the air; [and] the wreckage was radioactive." However, no evidence has ever surfaced to substantiate any of these claims, and Air Force investigation specifically refuted some claims, such as the supposedly radioactive wreckage. Captain Ruppelt wrote that "I had always heard a lot of wild speculation about the condition of Mantell's crashed F-51, so I wired for a copy of the accident report. [It] said that...Mantell's body had not burned, not disintegrated, and was not full of holes; the wreck was not radioactive, nor was it magnetized." Mantell was the first member of the Kentucky Air National Guard to die in flight. According to John Trowbridge, historian of the Kentucky National Guard, "There is a real X-Files twist to this, too. Mantell lived almost his entire life in Louisville. But he was born in a hospital in Franklin, only a few miles from where he was killed." In 1956, Ruppelt wrote that the Mantell crash was one of three "classic" UFO cases in 1948 that would help to define the UFO phenomenon in the public mind, and would help convince some Air Force intelligence specialists that UFOs were a "real", physical phenomenon. The other two "classic" sightings in 1948 were the Chiles-Whitted UFO encounter and the Gorman dogfight. The Mantell crash was investigated by Project Sign, the first Air Force research group assigned to investigate UFO reports. One writer noted that "The people on Project Sign worked fast on the Mantell Incident. Contemplating a flood of queries from the press as soon as they heard about the crash, they realized that they had to get a quick answer. Venus had been the target of a chase by an Air Force F-51 several weeks before and there were similarities between this sighting and the Mantell Incident. So...the word 'Venus' went out. Mantell had unfortunately been killed trying to reach the planet Venus." An Air Force major who was interviewed by several reporters following Mantell's crash "flatly stated that it was Venus." In 1952 USAF Captain Edward Ruppelt, the supervisor of Project Blue Blook, Project Sign's successor, was ordered to reinvestigate the Mantell Incident. Ruppelt spoke with Dr. J. Allen Hynek, an astronomer at Ohio State University and scientific consultant to Project Sign and Project Blue Book. Hynek had supplied Project Sign with the Venus explanation in 1948, mainly because Venus had been in the same place in the sky that Mantell's UFO was observed. However, by 1952 Dr. Hynek had concluded that the Venus explanation was incorrect, because "Venus wasn't bright enough to be seen" by Mantell and the other witnesses, and because a considerable haze was present that would have further obscured the planet in the sky. Ruppelt also noted Dr. Hynek's statement that Venus, even if visible, would have been a "pinpoint of light", but that eyewitness "descriptions plainly indicated a large object. None of the descriptions could even vaguely be called a pinpoint of light." Having rejected the Venus explanation, Captain Ruppelt began to research other explanations for the incident. He was particularly interested in a suggestion by Dr. Hynek that Mantell could have misidentified a US Navy Skyhook weather balloon. Others disputed this idea, noting that no particular Skyhook balloon could be conclusively identified as being in the area in question during Mantell's pursuit. Despite this objection, Ruppelt thought the Skyhook explanation was plausible: the balloons were a secret Navy project at the time of Mantell's crash, were made of reflective aluminum, and were about 100 feet (30 m) in diameter, consistent with Mantell's description of a large metallic object. Since the Skyhook balloons were secret at the time, neither Mantell nor the other observers in the air control tower would have been able to identify the UFO as a Skyhook. Furthermore, later research by Project Blue Book and UFO skeptics revealed that multiple Skyhook balloons had been launched on 7 January 1948 in Clinton County, Ohio, approximately 150 miles (240 km) northeast of Fort Knox. UFO skeptic Philip Klass argued that wind currents at the time would have blown the balloons close to the area of the Mantell Incident. Additionally, when Captain Ruppelt investigated the case in 1952, he found that at least two observers in separate locations had reported viewing the object Mantell chased through a telescope, and both observers stated that it was a large balloon. Project Skyhook was legally linked with General Mills, the cereal company, Jean Piccard, the French Balloonist, and Otto C. Winzen of Winzen Research. Researchers have also noted that while Mantell was an experienced pilot, he was rather new to the P-51, and that this relative inexperience could have been a factor in the crash. Captain Thomas Francis Mantell Jr. (30 June 1922 – 7 January 1948) was a United States Air Force serviceman and a World War II veteran. Mantell was awarded the Distinguished Flying Cross for courageous action during the Normandy landings, and an Air Medal with three Oak leaf clusters for heroism. Mantell graduated from Male High School in Louisville. On 16 June 1942, Mantell joined the U.S. Army Air Corps, finishing Flight School on 30 June 1943. During World War II, he was assigned to the 440th Troop Carrier Group which air dropped the 101st Airborne Division into Normandy, France on 6 June 1944. After the war, Mantell returned to Louisville, joining the newly formed Kentucky Air National Guard on 16 February 1947. Following his death in January 1948, Mantell's remains were returned to Louisville for burial in the Zachary Taylor National Cemetery. On 29 September 2001, the Simpson County Historical Society unveiled a historical marker in honor of Thomas Mantell in his hometown of Franklin. The marker is located at the exit off Interstate 65. ↑ 2.0 2.1 Ruppelt, p. 56. ↑ News Release of Clinton County Army Air Field dated 8 January 1948. ↑ Report of Albert Pickering. ↑ quoted in Michael D. Swords' (2000) "Project Sign and the Estimate of the Situation"
↑ 8.0 8.1 Ruppelt, p. 48. ↑ 9.0 9.1 Peebles, p. 23. ↑ 10.0 10.1 Peebles, p. 24. ↑ 18.0 18.1 Ruppelt, p. 51. Jul 16 PBY Catalina "Miss Macao"
This page was last modified on 8 January 2016, at 23:51.